Happy hump day, everyone! Here’s a brand new edition of Cheap Date where I will recommend $30 of nerdy entertainment to help you get through the week. We have a great double-double for you this week, two movies and two comics for you to enjoy. Natalia and I were lucky to catch a early screening of 42 this week and we absolutely loved it. The story of Jackie Robinson is a great sports movie as well as good moral story without beating it over the head with the idea. The best part about the movie is that film is actually fun and we laughed quite a bit. Danny Boyle’s next film dealing with hypnotism and featuring James McAvoy actually came out last week in limited release but will hit all theaters this week. Boyle has a great list of movies under his belt and the trailer shows that this thriller may be up to par. As you may be aware, Apple banned this issue from being sold on any apps for iOS but even without the controversy Saga is definitely a book you should read. 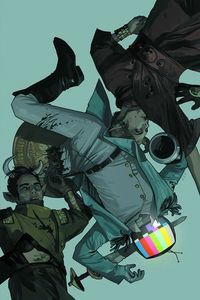 Brian K. Vaughan’s writing coupled with Fiona Staples art have truly made this a must-read book and it is still early enough that you can jump on board. Tomasi and Gleason’s continues with Batman’s recovering from the death of Damian. They are one of the best creative teams in the business and the issue introduces an Elseworlds character in the main DC universe. Now the question becomes how will this character affect the Dark Knight. That will do it for me this week. Hopefully you enjoyed my recommendations and come back next week for a brand new edition of Cheap Date. Carrie’s related to one of the best comics ever made, so, now that DC decided to make her come back, I don’t think she will be a wallflower: even if Tomasi said that she’s not exactly the new Robin, I’m sure (and I do hope) she will be strongly present in Batman’s life from now on.